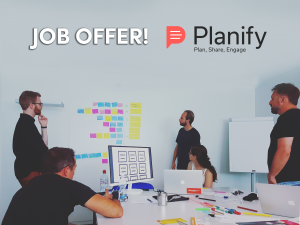 Planify is Growing - Do You Want to Be Part of an Exciting Adventure? Do you want to be part of an exciting journey? Planify is a spin-off Coteries Lab, a web & mobile application development agency based at EPFL Innovation Park in Lausanne. Trusted by renowned companies like Swisscom, Local.ch, EPFL and startups, Coteries Lab is specialized in the development of prototypes (so called “Minimum Viable Products”) to help test and iterate new concepts and ideas, as well as building websites and mobile applications for its customers. Planify is born from experiencing ourselves the pains of group travel: receiving many emails of the tour plan with a few updates on the PDF. Which are both a nightmare to track and generating some kind of insecurity, as you’re never sure to have kept the most-recent version! We successfully tested the first version of Planify with our biggest customer, which was planning an “Top Executives Learning Tour” to Silicon Valley. Since then, we have massively improved our group travel planning solution and convinced hundreds of customers to use Planify. What is Planify? It’s a tool that helps travel agencies, tourism offices, tour operators or HR department sharing the program of a group travel (delegations, incentive travel, study trips) via a mobile app, with enriched features (participants’ profiles, documents, pictures, etc.). Planify helps saving time on planning and sharing the travel itinerary, with the major benefit for participants to always have an up-to-date program in their pocket. are proactive, dynamic, curious, organized, are likeable and have a smiling personality! The opportunity to grow and progress your skills and career! get attractive upsides to reward your performance. search relevant keywords and optimize Adwords campaigns. We are passionate about building and launching digital products. Please send your CV and all other relevant information to: Sébastien Flury, CEO.